Your brake pads provide the friction necessary to stop your vehicle slowly. When the brake pedal is pressed, the brake pad touches the rotor and slows your wheel down. If there is a problem with your brake pads, you may notice squealing or grinding noises. If you press your brake pedal and you hear a grinding noise while driving, your brake pads need to be replaced immediately. Brake pads last roughly 50,000 miles, but this can be lower if you press on your brakes more often than normal. 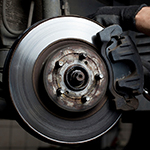 If you drive your car when the grinding noise is loud, you are at risk to losing your brakes completely while driving. At MINI of Charleston, we want you to stay safe when driving your vehicle and don't want you to get stranded without working brakes. If you have a problem with your brakes, bring your vehicle to our dealership and have your car serviced to keep your vehicle running well.